The wines of Leo Hillinger from Austria are known all over the world. The main public face of Weingut Leo Hillinger for consumers in the US and Asia, along with Leo Hillinger of course, is Michael Hoeffken, Sommelier, Assistant Winemaker and Sales Person at Weingut Leo Hillinger. I was in Austria this summer, including in Hofturn in Burgenland, by car just 30 minutes away from Jois, where Weingut Leo Hillinger is located. When Michael heart about this, he invited me over and we spent a couple of hours together at the winery. 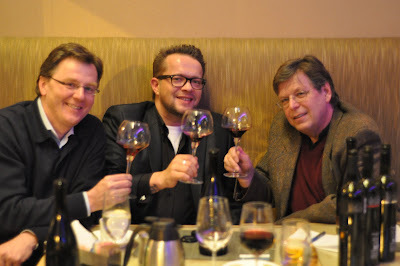 We were joined by Edgar Brutler, the winemaker and also by Leo Hillinger. I had met Michael Hoeffken the first time in Vienna, Austria and then later in Washington DC, where we tasted some Leo Hillinger red wines. Weingut Leo Hillinger is in Jois in the Neusiedlersee area in Burgenland. Burgenland is one of Austria’s 4 wine regions – Lower Austria, Styria, Burgenland and Vienna. For many years it was a bit on the margin, although it has a long wine growing tradition. 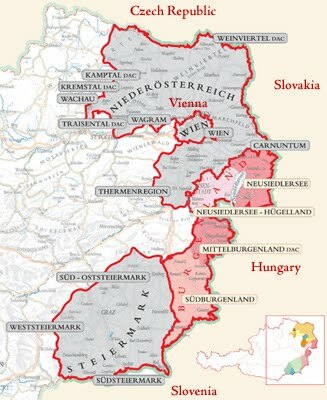 Burgenland belonged to Hungary until 1921 when it was annexed to Austria post WWI. It is a melting pot of Magyar, Slavic and Austrian cultures. Many of the towns have two names, one Croatian or Hungarian and the other name Austrian. The vineyard area of Burgenland totals 14.000 hectares and comprises 4 areas: (1) Neusiedlersee: At the edges of the vast and shallow Lake Neusiedl, a variety of grapes are grown on 9.100 hectares of vineyards, including world-famous noble sweet wines. (2) Neusiedlersee-Hügelland: At the foot of the Leithagebirge and west of Lake Neusiedl, a variety of grapes are grown on 4.150 hectares of vineyards, including the renowned Ruster Ausbruch. (3) Mittelburgenland: On 2.100 hectares of vineyards, one red grape variety plays the leading role: Blaufränkisch and 4 towns are the wine-growing area´s main producers: Deutschkreutz, Horitschon, Lutzmannsburg and Neckenmarkt. (4) Südburgenland: One of Austria´s smallest wine-growing areas, where excellent terroir wines are produced from 500 hectares of vineyards, which are situated mainly on the Eisenberg, with Blaufraenkisch being the typical red wine. Leo Hillinger took over from his father in 1990. At the time, the Weingut was tiny with only one hectare of vineyard area. Under Leo’s stewardship the winery has seen a phenomenal growth. Today, the vineyard area totals 46 hectares, of which 26 hectares are in Jois in the Neusiedlersee region, and another 20 hectares in and around Rust in Neusiedlersee-Huegellland. 60% of the area is planted with red varieties - Blaufränkisch, Zweigelt, St. Laurent, Pinot Noir, Cabernet Sauvignon, Merlot and Syrah - and the remaining 40% are planted with the white varieties - Welschriesling, Sauvignon Blanc and Chardonnay. In addition, grapes are sourced from contract growers with another 70 hectares of vineyards. Weingut Leo Hillinger is one of the top names in Austria. It ranks among Austria's largest producers of premium wines. More than 50% of the production is exported. The winery in Jois is an impressive super-modern building in the middle of the vineyards. Michael explained that the new production site with an associated tasting and seminar center was constructed in 2004 for 6 million Euros. The sensitive location in the midst of the Jois vineyards required special attention. The major part of the L-shaped production building was cut deeply into the slope, subsequently covered with soil and as far as possible replanted with grapes; 24.000 cubic meters of soil had to be moved and re-moved during the course of construction. The visible part with the cubic tasting lounge seems to hover upon slim V-shaped pillars over the ground. The large window opens to the vineyards and the Leithagebirge mountain range; at night it presents a recognizable landmark beacon that can be seen from far away. Eight northern-facing, pyramidal roof windows allow for natural light to illuminate the subterranean production hall, which ranks among the most modern in Europe. The newly planted accessible roof terrace offers wonderful views of Lake Neusiedl. Michael and Edgar took me to the cellar and showed me around. We did some barrel tasting there. Edgar explained that the cellar technique equipment ranks among the most modern in Europe. The computerized cellar secures hygienic and safe production measures which meet highest quality standards. Fermentation of the selected grape material takes place in computer-controlled stainless steel tanks. These fermentation vessels used in the Hillinger winery are jacketed tanks allowing cool fermentation and maturation of the wine due to refrigerating coils between the two walls – a fact which plays an important role in white wine production. Furthermore the stainless steel tanks guarantee a production according to highest hygienic guide lines as well as a controlled fermentation due to exact temperature regulation. Especially fresh fruity wines like Welschriesling, Riesling, Sauvignon Blanc and light red wines are vinificated in stainless steel tanks. The barrique-barrels of the Hillinger Winery are exclusively made of French oak. With regard to white wine, barrique barrels are predominantly used for fermentation while with red wines only maturation takes place in barriques. Typically, the barriques are only used twice at Weingut Leo Hillinger. After the cellar tasting we went outside to see a bit of the vineyards that are in Jois. We had a wonderful view of Lake Neusiedl. Above all, Michael said, the warm and sunny climate in Burgenland is decisive for the wine quality. The near Lake Neusiedl accounts for rising temperatures in summer which lead to higher sugar gradations and full-bodied wines. The soils on which the grapes ripen are an additional criterion. They decisively influence the character of the wines. The light, dry loess and black earth soils are responsible for powerful compact wines. With regard to vineyard management, Weingut Leo Hillinger favors integrated plant protection, green manure and biological fertilization of the vines. Fertilization measures are applied with an eye on biological balance while organic fertilizers are used only in a supportive manner. Traditional harvesting as practiced at the Hillinger Winery, Michael said, signifies picking grapes by hand. Harvesters and contractual vintners pick the grapes into small boxes and deliver them directly to the production site of our winery where the cellar master conducts a final quality control. We finished up in the tasting room and the conference center. Leo Hillinger joined us there. The large window opens to the vineyards and the Leithagebirge mountain range. Inside, glass walls grant visitors insight into the various working spheres of the wine-grower. A bridge allows a view into the barrique cellar below while linking the tasting lounge to the multi-functional seminar room behind. The entire floor space of the object comprises 1850 square meter. Mainz in Germany is one of 9 wine capitals of the world, along with: Bordeaux (France), Bilbao-Rioja (Spain), Cape Town (South Africa), Florence (Italy), Mendoza (Argentina), Porto (Portugal), Christchurch (New Zealand) and San Francisco-Napa Valley (USA). This is the Great Wine Capitals (GWC) Network. Like Vienna, there are vineyards and wineries within the city’s borders. Wine making in Mainz goes back to the period, when Mainz/Mogontiacum was part of the Roman empire. Today, the vineyard area of Mains is about 200 hectares. The winemakers are mostly based in the southern suburbs Ebersheim, Hechtsheim and Laubenheim. One of the winemakers of Mainz is the City of Mainz itself, which has its own winery. But it has recently been long-term leased to the Fleischer family and has become an integral part of their wine business. There are about 2 dozens of winemakers in Mainz. The top without doubt is Weingut Fleischer und Weingut der Stadt Mainz. In particular the red wines of Michael Fleischer are remarkable. Following are two young women, who are good friends. Eva Vollmer of Weingut Vollmer, Gault Millau Discovery of the Year 2010, and Mirjam Schneider, who runs Weingut Lothar Schneider und Tochter. I have reported about Eva here and Mirjam here. A good place to get to know the winemakers of Mainz is the Mainz Farmer's Market Breakfast on Saturday morning. There, during the warmer months of the year, the winemakers of Mainz have a booth where one of them presents his or her wine. Even with unpleasant weather conditions, there is always a large crowd hanging out for a couple of hours after having done the food shopping on the farmer’s market. The Mainz Farmer's Market takes place where it always has: in the very heart of the city next to the next to the 1000 years old Mainz Cathedral. From dawn ‘til dusk, Saturdays throughout the year, farmers and distributors bring fresh produce, fruit, meats, savory foods, spices, herbs, condiments, meats, fish and cheeses as well as home-made specialties to sell here. The Mainz Farmer's Market isn’t merely a market – it’s an excursion. When I am in Frankfurt, I always try to go there Saturday morning, to do the vegetable and fruit shopping for the coming week and to have a couple of glasses of wine at the Farmer’s Market Breakfast. If I want lunch and more wine, I move on to my favorite wine tavern, Weinhaus Bluhm, in the old part of the town. But sometimes, I stay at the Marktfruehstueck and eat something at the many stands in the vicinity of the Marktfruehstueck that offer quick bites - Tartarbroetchen (half a roll with butter, steak tartar and onions), Fischbroetchen (a roll with herring) and Fleischwurst. The latter - a sausage - in particular is a very popular quick bite in Mainz. In the context of a forthcoming wine tasting of the German Wine Society (Washington DC Chapter), lead by Lindsay Morris, I visited Weingut Georg Albrecht Schneider in Nierstein, Rheinhessen in Germany recently. The wine tasting in Washington DC will have 2 pillars. If you follow German wines in the American wine blogger scene, you inevitably come across the wine blog Lindsay du Vin. The author is Lindsay Morriss, an energetic and very charming young women from Rhode Island, who just graduated with a MBA from INSEEC in Bordeaux. Her MBA thesis was on how to improve the profile of German wine in the United States. She will provide a summary of her findings. Secondly, as part of her studies, Lindsay interned at Weingut Georg Albrecht Schneider in Nierstein, Germany. Weingut Georg Albrecht Schneider is well known in the German wine scene in the US, as it exports about half of its production. We were lucky and able to arrange a tasting of exclusively Georg Albrecht Schneider wines. As part of the tasting, I was charged with the task to visit Weingut Schneider while I was in Germany during the summer and take pictures to be presented in Washington DC. This was not my first visit of Weingut Georg Albrecht Schneider. I had visited Weingut Georg Albrecht Schneider before, and had met owner Ulrike Schneider in Washington DC earlier. Since the US is such an important market for them, the Schneiders come regularly to the US. Weingut Georg Albrecht Schneider is located in Nierstein in Rheinhessen. Nierstein sits on the banks of the river Rhine between Mainz and Worms, to the north-west of Oppenheim. Although it does not have an imposing church like Oppenheim, Nierstein has a certain simple charm that its neighbor lacks. Weingut Georg Albrecht Schneider is owned by Albrecht and Ulrike Schneider. The vineyard area totals 15 hectares. More than two thirds of the area is planted with Riesling; other grape varieties include Müller-Thurgau and Silvaner. “We own many very good vineyards and have planted them with Riesling” Albrecht Schneider said. In addition, grape juice, perlé wine, bottle-fermented sparkling wines and grappa-style spirits are also produced. Weingut Georg Albrecht Schneider has been exporting for over 30 years, currently about half of its output. Of the export, 70% goes to the US and the remainder to Japan. “Our big markets in the US are are Massachusetts, California and New York” said Albrecht Schneider. When I arrived at the winery, Ulrike Schneider was just having the traditional German/Austrian afternoon coffee and cake with her daughters Susanne (Susanne Müller-Minde) and Uschi (Uschi Müller) and her grandchild. I joined them for a cup of coffee and a piece of cake, before going to the vineyards with Susanne and Uschi, where Albrecht was working. Susanne and Uschi took me to the vineyards. They are located in the Rheinterrasse, the stretch of vineyards which runs from Bodenheim, south of Mainz, in the north to Mettenheim in the south, often referred to as the Rheinterrasse. The vineyards of the Rheinterrasse have a favored mesoclimate in comparison with others in the region. The Rheinterrasse accounts for one-third of the Rheinhessen’s Riesling wines. The wines from the Rheinterrasse were at some point even more expensive than Bordeaux wines. The visit ended at the Winery. Pictures: At the Winery - Tasting Corner - Ulrike Schneider says "Auf Wiedersehen"
Here are the wines from Weingut Georg Albrecht Schneider that we will taste. The tasting will be at the Harbour Square Club Room. The address for the tasting is 500 N St SW, Washington, DC. 20024-4605. The price for this tasting is $35 for members and $42 for non-members. The deadline is Tuesday, September 13. Please cut the reservation form - do not mail the entire page. When I used to live in Zagreb, Croatia, we basically had two options for going back to Germany to visit the family and friends: via Austria or via Italy. We would alternate and take advantage of getting to know different regions that lie between Zagreb in Croatia and Frankfurt am Main in Germany. On the Italian route, we would necessarily pass through Friuli - Giulia Venice and during lunch or dinner have a couple of glasses Pinot Grigio like the one I am writing about in this blog posting. Pinot Gris/Pinot Grigio/Grauburgunder has grayish-blue fruit. This explains the name: Pinot Gris (in France), or Pinot Grigio (in Italy) or Grauburgunder (in Germany) - Gris, Grigio and Gris mean “grey”. There are about 25,000 hectares of Pinot Gris/Pinot Grigio/Grauburgunder in the world, accounting for less than 0.5 percent of total wine production. With about 12,000 hectares, Italy (Pinot Grigio) is the front-runner, with Germany (4,000 h, Grauburgunder), California (3,000 h, mainly Pinot Grigio), Alsace (2,000 h, Pinot Gris) and Hungary (1.500 h) following. Oregon, with about 500 hectares, belongs to the group of smaller producers, along with New Zealand (700 h) and Australia (300 h). Pinot Grigio/Pinot Gris/Grauburgunder is a heat-sensitive grape that does not fare well in hotter climates as it needs colder temperatures to ripen fully and produce distinct flavors. It prefers a cooler climate with long, temperate summer days. Friuli-Venezia Giulia is in northeastern part of Italy. It was once part of the Venetian Republic and sections of it were under the influence of the Austro-Hungarian Empire for some time. The area is known predominantly for its white wines. The Friuli-Venezia Giulia region is bordered by the Alps to the north separating it from Austria. Slovenia borders the region on the east and the Italian region of Veneto forms the western border and part of the southern border with the Adriatic Sea. The northern half is very mountainous and gives way to flatter terrain and plains on the way to the sea. 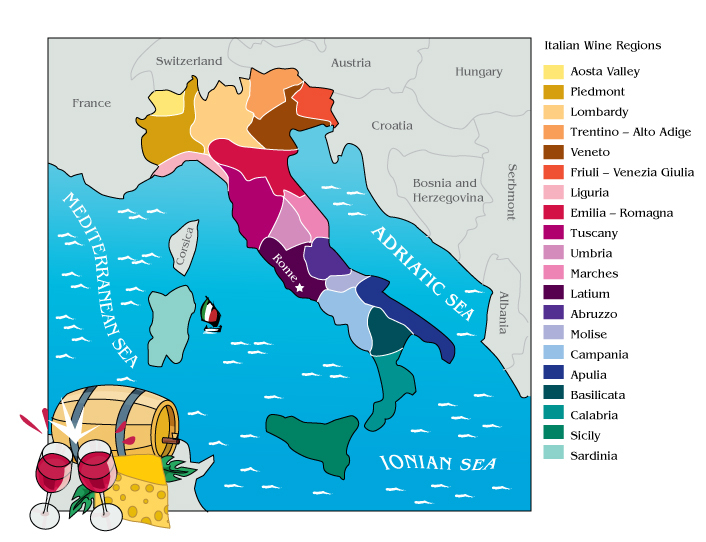 All Friuli-Venezia Giulia wines – as all Italian wines – belong to one of the following 4 quality levels. (1) Vino da Tavola (VDT): A very basic wine, made for local consumption; the bottle label does not indicate the region or grape variety. This is the wine you typically get served in a Pizzeria or Trattoria in Italy, when you ask for the “house wine”. Simple, cheap and decent. 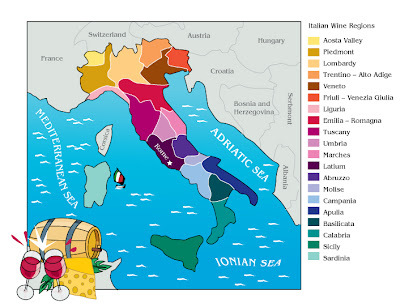 (2) Indicazione Geografica Tipica (IGT): Wines that are considered to be of higher quality than simple table wines, but which do not conform to DOC and DOCG regulations. Sometimes, these are premium wines of winemakers who dropped the DOC designation and instead carry the broader IGT designation, allowing them to try to improve quality by using nontraditional grapes, blends, viticultural practices or vinification techniques that are not included in DOC and DOCG standards. The region has 3 IGT designations: Alto Livenza, delle Venezie and Venezia Giulia. The Pinot Grigio I tasted was an IGT wine. (3) Denominazione di Origine Controllata (DOC). There are 11 DOC in the region. Almost 2/3 of the wine produced in the region falls under a DOC designation. (4) Denominazione di Origine Controllata e Garantita (DOCG). DOCG wines are a tick higher in terms of quality requirements than DOC wines (maximum yield for example), which is the highest category in Italy's wine-classification system. There are3 DOCG in the Friuli-Venezia Giulia area. The Attems Estate has 40 hectares of terraced slopes to the west of Gorizia under vine. The vineyards are located about 15 kilometers from the Adriatic coast. The slopes face the south and thus are protected from both the cold winds from the north and from Trieste. Winemaking in the Attems family goes back almost 1000 years; in 1106, records show that the Bishop of Salisbury gave the Attems family the estate for the purpose of cultivating vineyards and making wine. A few years ago, Attems entered a joint-venture with the renowned Marchesi de’ Frescobaldi family. The grapes were manually harvested in the third week of September and then for 2 weeks temperature-controlled fermented in stainless steel tanks. There was no malolactic fermentation. 15% of the production was then aged for 2 months in barriques. Tasting notes: Rich straw yellow with shimmering, ripe tropical fruit, along with apple and pear on the nose, refined, smooth palate, lively finish. The wine was provided to me by Folio Fine Wine Partners. Robert Mondavi’s son Michael Mondavi established Folio Fine Wine Partners in 2004, with his wife, Isabel, and their children, Rob and Dina. He co-founded Robert Mondavi Winery with his father Robert in 1966 and worked for many years in the company. I am sharing this posting with the Snooth community in the framework of the Snooth Global Tasting Initiative, using the hashtag #GTiPinotGrigio on Twitter.